The Trump administration is greatly expanding the number of people living in the U.S. illegally who are considered a priority for deportation, including people arrested for traffic violations, according to agency documents released Tuesday. 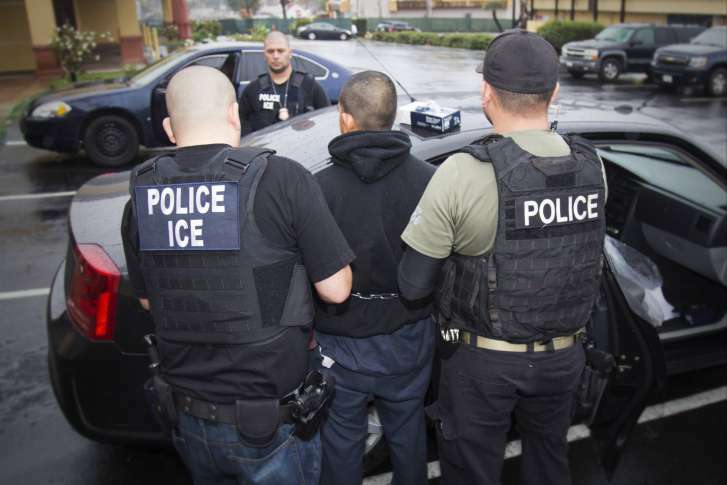 WASHINGTON (AP) — Millions of people living in the United States illegally could be targeted for deportation — including people arrested for traffic violations — under a sweeping rewrite of immigration enforcement policies announced Tuesday by the Trump administration. Any immigrant who is in the country illegally and is charged or convicted of any offense, or even suspected of a crime, will now be an enforcement priority, according to Homeland Security Department memos signed by Secretary John Kelly. That could include people arrested for shoplifting or minor offenses — or simply having crossed the border illegally. The Trump administration memos replace narrower guidance focusing on immigrants who have been convicted of serious crimes, are considered threats to national security or are recent border crossers. Under the Obama administration guidance, immigrants whose only violation was being in the country illegally were generally left alone. Those immigrants fall into two categories: those who crossed the border without permission and those who overstayed their visas. Crossing the border illegally is a criminal offense, and the new memos make clear that those who have done so are included in the broad list of enforcement priorities. Overstaying a visa is a civil, not criminal, offense. Those who do so are not specifically included in the priority list but, under the memos, they are still more likely to face deportation than they had been before. The new enforcement documents are the latest efforts by President Donald Trump to follow through on campaign promises to strictly enforce immigration laws. He’s also promised to build a wall at the Mexican border — he insists Mexico will eventually foot the bill — and Kelly’s memos reiterate calls for Homeland Security to start planning for the costs and construction. Trump’s earlier immigration orders, which temporarily banned all refugees as well as foreigners from seven Muslim-majority countries, have faced widespread criticism and legal action. A federal appeals court has upheld a temporary halt. Kelly’s enforcement plans call for enforcing a longstanding but obscure provision of immigration law that allows the government to send some people caught illegally crossing the Mexican border back to Mexico, regardless of where they are from. Those foreigners would wait in that country for U.S. deportation proceedings to be complete. This would be used for people who aren’t considered a threat to cross the border illegally again, the memo says. That provision is almost certain to face opposition from civil libertarians and Mexican officials, and it’s unclear whether the United States has the authority to force Mexico to accept third-country nationals. But the memo also calls for Homeland Security to provide an account of U.S. aid to Mexico, a possible signal that Trump plans to use that funding to get Mexico to accept the foreigners. Historically, the U.S. has quickly repatriated Mexican nationals caught at the border but has detained immigrants from other countries pending deportation proceedings that could take years. The memos do not change U.S. immigration laws, but take a far harder line toward enforcement. One example involves broader use of a program that fast-tracks deportations. It will now be applied to immigrants who cannot prove they have been in the United States longer than two years. It’s unclear how many immigrants that could include. Since at least 2002 that fast deportation effort — which does not require a judge’s order — has been used only for immigrants caught within 100 miles of the border, within two weeks of crossing illegally. The administration also plans to expand immigration jail capacity. Currently Homeland Security has money and space to jail 34,000 immigrants at a time. It’s unclear how much an increase would cost, but Congress would have to approve any new spending. The American Civil Liberties Union said it would challenge the directives. “These memos confirm that the Trump administration is willing to trample on due process, human decency, the well-being of our communities, and even protections for vulnerable children, in pursuit of a hyper-aggressive mass deportation policy,” said Omar Jadwat, director of the ACLU’s Immigrants’ Rights Project. However, Rep. Lamar Smith, a Texas Republican who sits on the House Homeland Security Committee, applauded the Trump effort, saying the memos “overturn dangerous” policies from the Obama administration. The directives do not affect President Barack Obama’s program that has protected more than 750,000 young immigrants from deportation. The Deferred Action for Childhood Arrivals remains in place, though participants could be deported if they commit crimes or otherwise are deemed to be threats to public safety or national security, according to the department. During the campaign Trump vowed to immediately end that program, which he described as illegal amnesty. The directives indicate that some young people caught crossing the border illegally by themselves may not be eligible for special legal protections if they are reunited with parents in the United States. And those parents or other relatives that the government believes helped the children would face criminal and immigration investigations. Under the Obama administration, more than 100,000 children, mostly from Honduras, El Salvador and Guatemala, were caught at the border. Most were reunited with parents or relatives living in the United States, regardless of the adults’ immigration status. The enforcement memos also call for the hiring of 5,000 new Border Patrol agents and 10,000 Immigration and Customs Enforcement agents, but it’s unclear how quickly that could take place. Currently, two of every three applicants for Customs and Border Protection jobs fail polygraph exams and there are about 2,000 vacancies. The government also plans to review a program that allows local police and jailers to act as immigration agents and a program that used fingerprint records from local jails to identify immigrants who had been arrested.